Madison Edgewood's Caroline Lake chips onto the ninth green to end her round Tuesday at University Ridge. Madison Edgewood coach Peggy Gierhart embraces Tess Hackworthy, facing, after the round. Caroline Lake was all smiles after her championship performance, celebrating with hugs and group pictures. 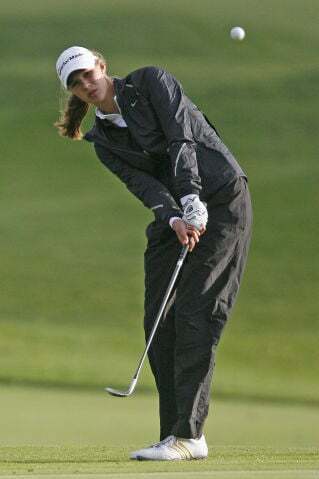 Minutes earlier, the Madison Edgewood junior had wrapped up a round of 4-under-par 68 on the final day of the WIAA Division 2 state girls golf tournament — the best round of any player, regardless of division, over two days at University Ridge Golf Course. She knew she had finished off a landslide victory in the individual race — and she figured she had helped the Crusaders to a runaway trip to their 12th state team championship in the past 13 years. What she didn’t know was one of her best friends, teammate Tess Hackworthy — who appeared to have come in second behind Lake — was in the process of admitting she had signed an incorrect scorecard, an error that led to her disqualification. The Crusaders still managed a 21-stroke margin of victory over team runner-up Fox Valley Lutheran after Hackworthy’s 75 was erased and replaced by Maddy Morrison’s 104. Celebrating, though, wasn’t so easy in the moments after the Crusaders got the news. “Just so many emotions,” Edgewood coach Peggy Gierhart said. “They all wrote down fives for her on No. 10, and then she forgot she had an unplayable drop. So after she got out of the tent, they saw GolfStat (the computerized scoring program) had her for a 76. She knew she had a 77. Although winning state championships have come like clockwork for the Crusaders, many weren’t so sure they were in the hunt for a repeat heading into the season. Lake and Hackworthy clearly were two of the best in the state, but having three new starters behind them left plenty of question marks. In the end, it was those new starters — Claire Parker, Katie Arneson and Morrison — whose scores made up the bulk of Edgewood’s team total on Tuesday. Lake’s brilliance on the course certainly helped, too. She recorded six birdies on the day, including three in a row to begin the back nine. Lake shot a 3-under 141 for the tournament and won the Division 2 title by 16 strokes (though Hackworthy’s score would have placed her 11 strokes behind her teammate). Lake’s score also was better than any Division 1 two-day total. Parker finished 10th at 28 over. Arneson shot a two-day total of 49 over and tied for 23rd; Morrison shot 56 over and came in 27th. McFarland senior Erin Culver, who made it to state as an individual, shot a 29-over-par 173 and finished 10th. Team scores: Madison Edgewood 332-349-681, Fox Valley Lutheran 352-350-702, Racine Prairie 372-359-731, Osseo-Fairchild 380-372-752, Spooner 396-394-790, Hayward 414-381-795. Top 10 individuals: Lake, ME, 73-68-141, Dufrane, Marinette, 78-79-157, Priebe, FVL, 80-77-157, Smith, Appleton Xavier, 80-81-161, Chapman, RP, 83-79-162, Wurflova, Luxemburg-Casco, 83-79-162, Steen, OF, 86-79-165, Schmidt, Gale-Ettrick-Trempealeau, 85-82-167, Parker, ME, 88-84-172, Erin Culver, McFarland, 87-86-173. Madison Edgewood: Arneson 100-93-193, Morrison 96-104-200. Fox Valley Lutheran: Koepp 88-86-174, Kluess 94-90-184, Glaser 90-97-187. Racine Prairie: Denman 96-88-184, Craig 92-95-187, Michicich 101-100-201. Osseo-Fairchild: Pederson 92-87-179, Vold 100-103-203, Wilson 102-103-205. Spooner: DeWitt 95-94-189, Schmock 93-99-192, Gostonczik 106-95-201, Revak 102-106-208. Hayward: Bowen 103-88-191, Radcliffe 102-95-197, Tremblay 100-97-197, Hansen 109-101-210. At University Ridge GC, par 72.